Participation is FREE and EASY, there is no cost and no extra work for you. Really care about sharing the joy of food with others! Submit your blog in the form below. Once verified, you'll receive more information and a confirmation link! Does my full recipe appear on CookEatShare? No it doesn’t. When a user searches your recipes and then clicks on one they are taken directly to your actual blog post with a CookEatShare header in place. Below the header is your actual blog, rather than the template, with access to the full recipe. However, a user can easily close that header and will not see it again until they return to CookEatShare. Does a hit on my recipe through my CookEatShare profile, also count as a page hit for my blog? Yes it does. When a user clicks on one of your recipe titles on CookEatShare, they are taken directly to your actual blog which leads to an impression for your blog post and all the advertisements on your blog page. I don’t want my full recipe to be visible, can I still join CookEatShare? Of course! You can create a profile and continue to upload recipes and photos, but then link to your blog for ingredients and directions. However in doing so, you will not be eligible for the benefits of the Author Network or to be featured on the home page. Does CookEatShare have rights to my content? Do I have to post recipes to my blog and CookEatShare? No. All you have to do is post recipes to your blog like normal and our blog crawler will recognize it and upload them to your CookEatShare profile. Just make sure you use a standard recipe format so that our little guy knows it’s a recipe and doesn’t accidently skip over it. How do I become featured on the homepage? 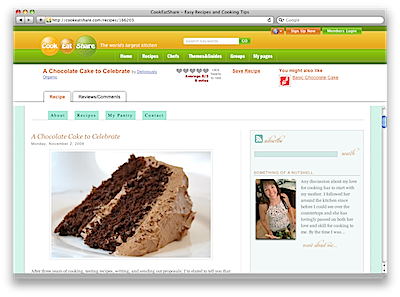 Recipes are featured as Top Recipes based on the number of views, ratings, reviews and comments posted on those recipes. Featured Chef’s are chosen from professional chefs on CookEatShare and are rotated randomly. All Featured Authors are listed under the Top Blogs link on the homepage and are ordered by the number of recipes posted on CookEatShare. I tried to claim my blog with a link from an e-mail I received, but that link isn’t working. The computer was having a bad case of the Monday’s and for some reason sent out links that had extra characters or didn’t include your unique link at all. The problem has since been fixed and you should have received a correction notice. If the link is still not working, contact Shalina at support@cookeatshare.com and she will make sure you get a link that does work. What happens after I claim my blog and post the badge to my blog? After you have received your unique (working) link and claimed your blog, you can start customizing your CookEatShare profile. Once you have it to your liking and download the badge you’re all set! Our crawler will crawl your blog, upload the recipes so you don’t have too and keep doing so. Then you can sit back and watch the traffic flow to your site. Why can’t I see the recipe I just added to my blog? Our crawler crawls your blog every few minutes to every few hours, depending how much is has to do that day. So your recipe will show up on your profile automatically, but it might take a little while. Check back in a couple hours. If it’s been a day or so and the recipe still isn’t showing up, let us know so that we can make sure nothing is wrong. Will this be like a second blog, I don’t think I have time for that? It won’t be a second blog. All you have to do is maintain your blog like you’re already doing and our network takes care of the rest. How do I stop receiving e-mails? We’ll be sad to see you go, but there is an unsubscribe button in the lower left corner of the e-mail. Simply click that and you will be removed from our list. What’s in this for CookEatShare? Because CookEatShare users who click on your recipe links go directly to your blog, and the header we place does not contain any advertising, we don’t make any direct revenue off of our Featured Author program. However, if one of our users finds the recipe they are looking for on CookEatShare because it is posted by one of our Featured Authors, then that user is more likely to come back and use CookEatShare again. So featuring your recipes is a win-win for both of us.